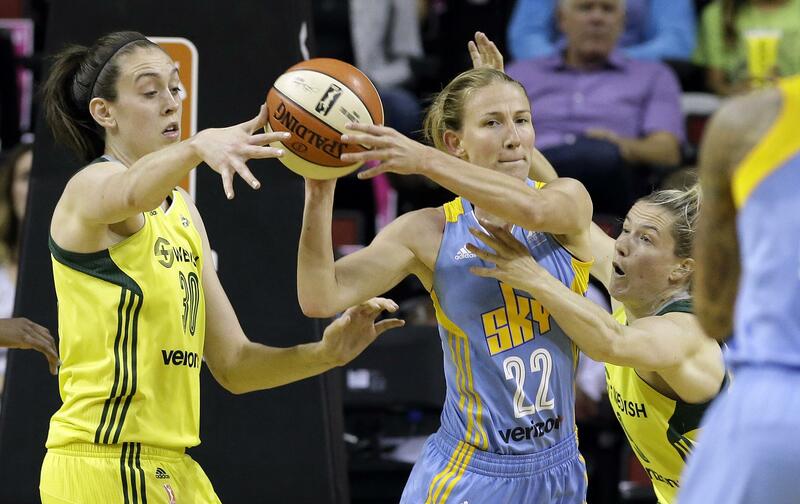 CHICAGO – Courtney Vandersloot became the seventh player to have a triple-double in WNBA history, finishing with 13 points, 10 rebounds and a career-best 15 assists in the Chicago Sky’s 114-99 victory over the Dallas Wings on Friday night. Vandersloot set a franchise record with 10 first-half assists and tied her team mark of 14 midway through the third quarter. Ticha Penicheiro holds the league record with 16, which she accomplished twice – in 1998 and 2002. She’s the first Sky player to accomplish the feat. Kahleah Copper scored a career-high 23 points on 9-of-10 shooting to help Chicago (8-16) snap a four-game losing streak. Allie Quigley added 21 points as the Sky scored the most points in franchise history, topping 107. Dallas center Elizabeth Cambage’s consecutive games with 35-plus points came to an end after being double-teamed for much of the game. She finished with 23 points for her 13th 20-point game of the season. Skylar Diggins-Smith added 21 points for Dallas (14-10), and Azura Stevens had 14 points and a career-high nine rebounds. Dallas coach Fred Williams was ejected for the second time in the last three games. Published: July 20, 2018, 8:34 p.m.